The advantages of Porex® PTFE are striking in terms of production, performance, product range, and cost of use. PTFE membrane discs are perfectly suited for laboratory scale filtration of aggressive organic solvents, concentrated acids, alkalis, and cryogenic fluids, which would attack other filtration membranes. They are also well suited for air sampling and particulate analysis. 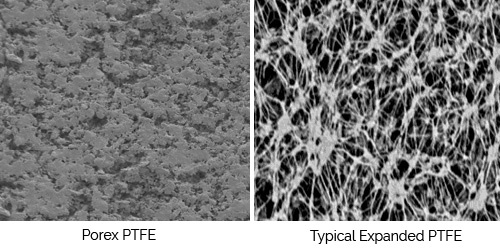 Porex® PTFE membranes offer a range of thickness and pore size previously unavailable to filtration device manufacturers. Since they require no laminated support, increased temperature and chemical resistance are possible. Porex® PTFE membranes are available in custom width rolls to accommodate automated assembly equipment for disposable disc filters. Standard disc thickness ranges from 0.5mm to 3.5mm, so Porex® PTFE discs are also suitable for use as column support in chromatographic separations.